PA official in charge of Jerusalem affairs dismisses Israeli court's decision ordering the closure of the Golden Gate on the Temple Mount. Adnan al-Husayni, the Palestinian Authority (PA) official in charge of Jerusalem affairs, on Sunday described the Israeli court's decision ordering the closure of the Golden Gate on the Temple Mount "void, invalid and worthless." 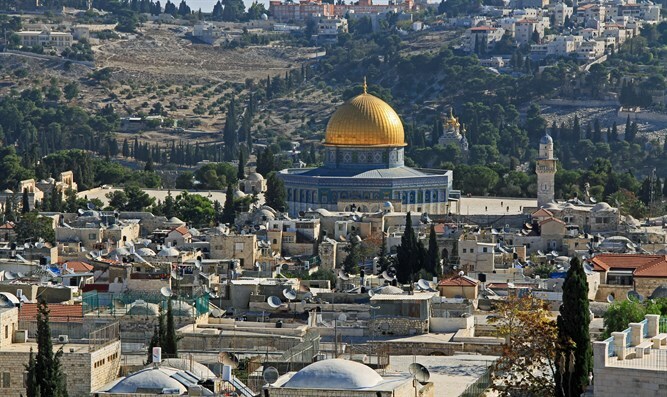 In a statement, Husayni said in response to the court's decision that non-Muslims have no authority to make decisions regarding the Temple Mount, and that only the Waqf has this authority. "The decision was made as part of the election campaign in Israel and within the framework of the aspirations of extremist Israeli elements in the Al-Aqsa Mosque, and therefore it carries many dangers," he wrote. "The Al-Aqsa Mosque and its area of ​​144 dunams belongs exclusively to Muslims, and an Israeli law or court have no authority over it." Husayni added that the Israeli court's decision was "a recipe for a religious war that the right-wing Israeli elements are pushing towards, because no Muslim will agree to an aggressive and dangerous decision that has been made as part of a long series of Israeli attacks against the mosque." The Golden Gate, also known as the Gate of Mercy or Bab al-Rahma in Arabic, has been closed off for the past 16 years, since it was discovered that those running the site were connected to the Hamas terror organization. Over the last several weeks, riots and clashes occurred on the Temple Mount as Muslims forcibly tried enter the closed compound. In one incident, rioters forced their way into the Golden Gate, after police officers were instructed to contain the rioters, but not to remove them from the area. The Temple Mount was left in the hands of the Jordanian Waqf following Jerusalem’s reunification in the Six Day War in 1967. The Waqf has taken advantage of this and removed every sign of ancient Jewish presence at the most Jewish holy site. PA officials reject Israeli attempts to enforce the law at the compound and accuse Israel of trying to “Judaize” the Temple Mount and Jerusalem.